SAUSAGE, BACON, OR HAM – $2 Produced on our farm from our own pigs that are pastured raised. Kids Plate – $6 Chefs choice, small portions of fruit, vegetables, cheese, sandwich or pancake & served with juice or chocolate milk. 3 Egg Omelet House Cheese $10 Served with toast. 3 Egg Omelet Loaded Veggies $14 Served with toast. 3 Egg Omelet Loaded Meat $14 Served with toast. 3 Egg Omelet Fully Loaded Meat, Veggies & Cheese $15 Served with toast. Saucy Eggs Gone Mad & Toast $12 Poached eggs in house marinara sauce served over tortilla with greens, house sausage & pepper jack curds. Poutine & Meat $14 Mashed potatoes or home fries, choice of meat, house squeaky curds and house gravy. **Made in-house and handcrafted. All burgers are made with a selection of our grass-fed beef, pork, chicken, & turkey. Ask server for weekly details. Most of the ingredients in our menu are grown &/or produced on our farm. If you have any questions about how we raise/grow our food, please do not hesitate to ask. 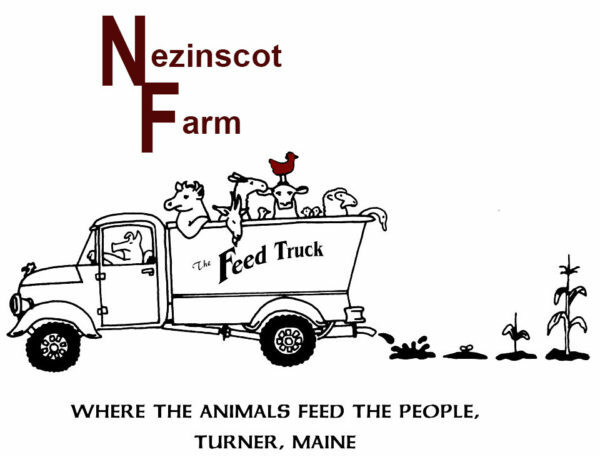 Nezinscot Farm Cafe is a friendly and casual farm to table cafe restaurant with a warm and welcoming vibe. We offer a variety of food and drinks, including breakfast classics, specialty sandwiches, soups, satisfying house salads, Equal Exchange coffee and tea, and an assortment of homemade baked goods. Stop in for a freshly made beverage! Coffee, steamed milk, turmeric, coconut oil, a dash of black pepper, maple syrup. Brewed black tea, chai spice blend, steamed milk. Choose from a variety of bagged and loose blends.